All members of the congregation are invited to attend. 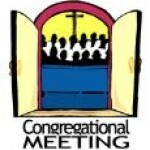 Confirmed and/or adult members of the congregation are entitled to vote on the budget and new representatives to the Council and Planning Groups. We need your presence and input at this meeting! Please join us as we chart our future!